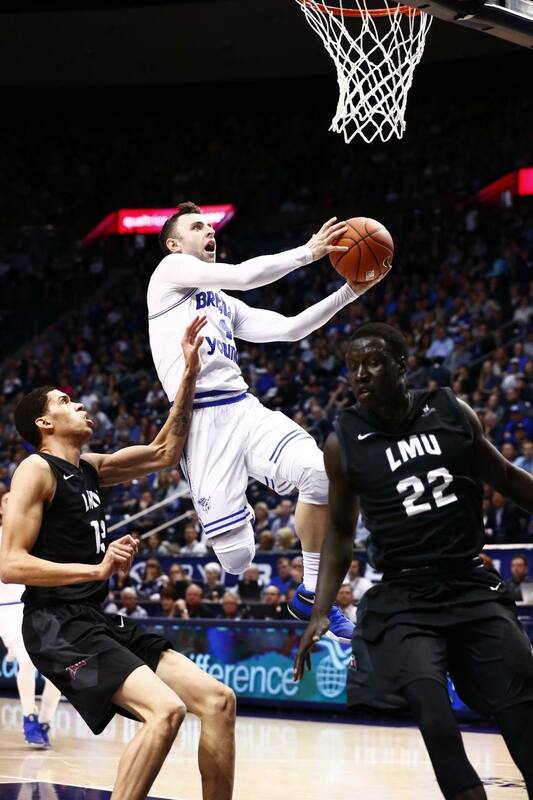 PROVO – Four players reached double figures in BYU’s 85-77 win over Loyola Marymount in the Marriott Center on Saturday night. Free-throw shooting and rebounds made the difference in the win. BYU (16-7, 7-3 West Coast Conference) made 28 free throws, which is more than the amount of free throws attempted (25) by LMU (10-11, 3-7 WCC). The Cougars also outrebounded the Lions 46-32. Eric Mika led all scorers with 27 points, nearly earning a double-double with nine rebounds. He also tied his career high in blocks with four. TJ Haws scored 19 points, including three treys. Nick Emery and Yoeli Childs reached double figures in scoring as well with 11 and 10, respectively. Mika started the game with five quick points to get the Cougars up early. The Lions responded, however, taking the 8-7 lead with 17 minutes left in the half. A step-back jumper from Mika put BYU back on top, but the two teams traded leads for a few minutes. The Cougars started to pull away by going on a 9-2 run, capped off with Steven Beo dishing it to Mika for the alley-oop. That put the home squad up 26-18 at the 10:23 mark. Free throws from Beo two minutes later gave BYU its first double-digit lead, 30-20. LMU fought back into the game, putting together an 8-2 run to tie the game at 34-34 with just over five minutes until the break. The Cougars battled to regain control, scoring five straight to earn a 39-34 advantage with 3:27 on the clock. The two teams battled in the final minutes of the first half for the lead heading into the locker room. The Lions were up 40-39 with less than a minute to go, but free throws from Mika and a breakaway layup by Emery gave the Cougars the 43-40 edge at the break. Haws caught fire to start the second half, drilling two 3-pointers to push the lead to 49-44 in the first few minutes. After the two teams traded baskets for a few minutes, Haws hit another trey to extend the lead to 59-51 with 15:08 to play. Starting with Beo’s layup at the 16:20 mark, BYU got rolling. The Cougars went on a 12-2 run, led by five points from Haws during that stretch, to get up to a 64-52 lead with just under 10 minutes to go. Mika scored five points of a 6-0 run for BYU that extended the lead to 70-54 at the 8:27 mark. However, LMU gradually begin to close in on the lead. The Lions went on an 8-0 run to make it 71-64 before a jumper from Mika at the 6:07 mark stopped the momentum. After a driving layup from Elijah Bryant with 4:41 to play, the Cougars did not score a single field goal until 29 seconds were left and Mika scored a bucket. BYU was forced to keep the game in hand at the free throw line, making 8 of 10 in the last four minutes. Those shots from the charity stripe were enough to hold off the Lions, 85-77. The Cougars continue their three-game home stand, hosting nationally ranked Gonzaga on Thursday at 9 p.m. MST. The conference matchup will be televised live on ESPN2 with radio options on the Cougar IMG Sports Network, KSL 1160 AM/102.7 FM and BYU Radio –Sirius XM 143. Going back to the last game of his freshman year, sophomore Eric Mika has scored in double-digits in 24-straight games. He wound up with 27 points for his 12th 20-plus game this season. Mika’s early block gave him at least one block in all but three games this season. On the night, he tied a career high of four blocks, giving him a season total of three four-block games. Ranked second nationally in both free-throw attempts and makes, Mika went 11-of-14 from the line. It’s his fourth game in 2016-17 with at least 10 made free throws. TJ Haws made 3-of-7 3-pointers. 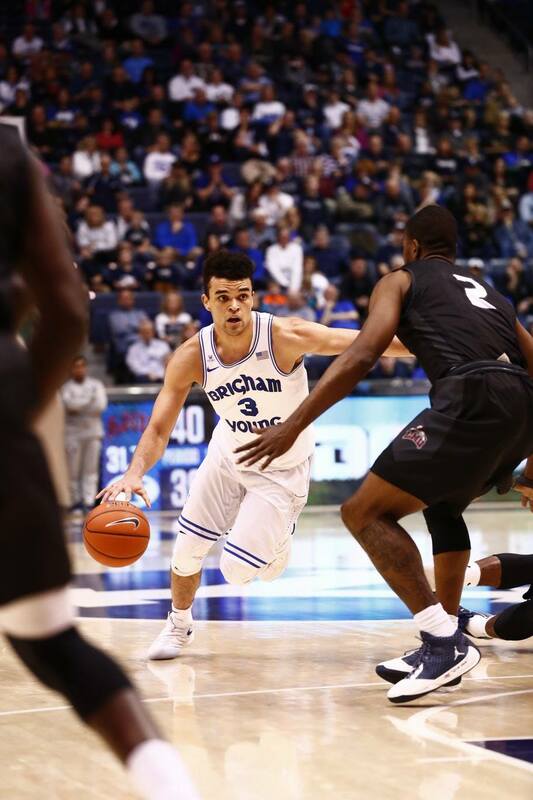 He’s hit at least three 3s in 11 games this season, the second most for a BYU freshman. Nick Emery made 1-of-4 3-pointers to up his school record streak of 32 straight games with at least one 3. With seven points, Steven Beo had his best scoring game since his 12 points against Santa Clara on Dec. 29. Yoeli Childs scored 10 points for his seventh game in double figures this season. Elijah Bryant had a career-best eight rebounds. The Cougars made their first seven field goals to start out the game. BYU’s 28 made free throws (on a season-high 44 attempts) are the most in a game this season since the opener against Princeton, when the Cougars made 30. The Cougars shot 53 percent on the night. They are now 9-0 this season when making at least half of their field goals. With 85 points, BYU improved to 10-1 when scoring at least 80 points at home.